March and Simon's Organizations has become a classic in the field of organizational management for its broad scope and depth of information. 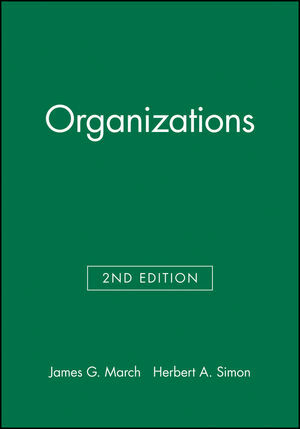 Written by two of the most prominent experts in the field, this book offers invaluable insight on all aspects of organizational culture through deep discussion of organization theory. The definitive reference for topics including bounded rationality, satisficing, inducement/contribution balances, attention focus, uncertainty absorption and more, this seminal text offers authoritative insight with a practical grounding in the field. James G. March is Professor of Organizational Theory, Emeritus, Graduate School of Business; Professor of International Economics, Emeritus; Professor of Political Science and Professor of Sociology, School of Humanities and Sciences; Professor of Education, School of Education - Stanford University.